I've posted this recipe before, but I wanted to share it again (with fresh pictures) for freezer week! 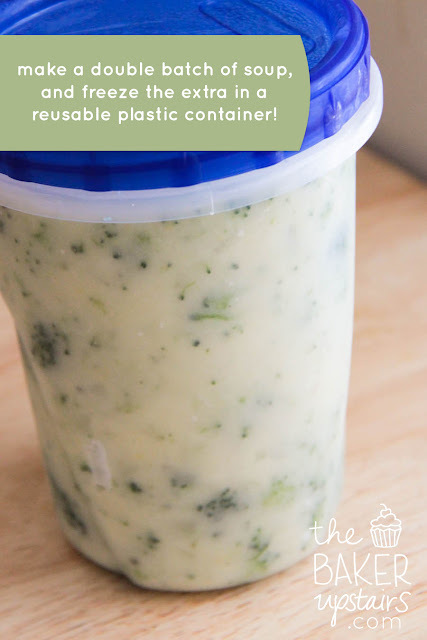 This is another of my favorite recipes to have in the freezer at all times. I love that it's so easy to throw the beans together in the morning, and then they cook all day and smell amazing. Plus, the recipe makes a ton, so it's only a little work for a lot of payout. 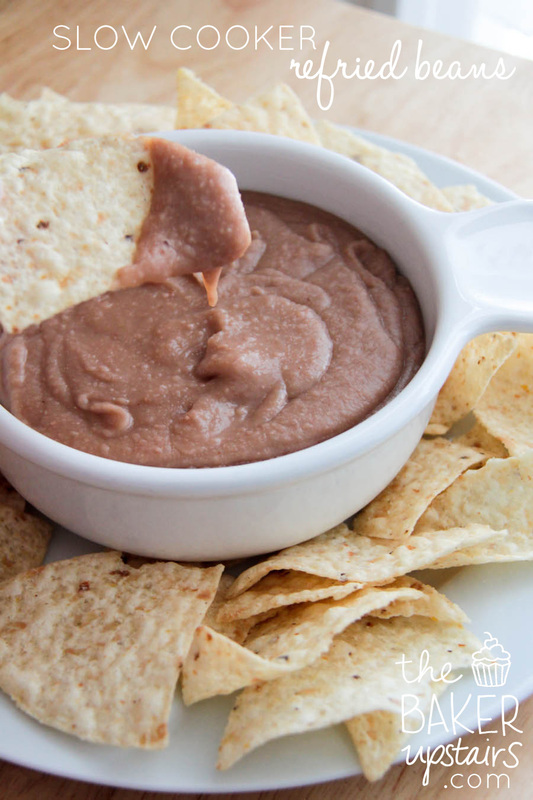 We use refried beans in so many things... burritos, tostadas, nachos, as a side dish, even just as a snack with tortilla chips! My super picky five year old Abby is completely obsessed with these beans, and wishes she could have them for every meal. I usually get about three pints of refried beans from a pound of dried beans, which means they are very economical compared to store-bought refried beans. Plus they taste amazing! Give them a try! 1 medium jalapeño, diced small, seeds removed. Rinse beans with cool water. 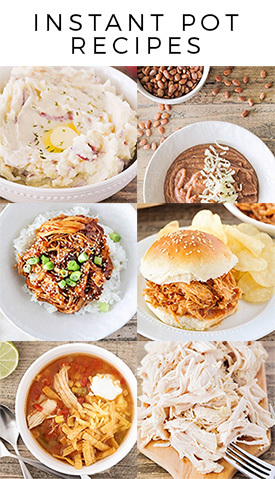 Place in a slow cooker. Add onion, jalapeño, garlic, cumin, chili powder, and black pepper. Pour water over the top. Cover and cook on high for 4-5 hours or on low for 8 hours. (The longer they cook, the easier they will be to mash.) After the beans are cooked, remove as much water as possible (I usually get about one cup of liquid out) and reserve in a small bowl or measuring cup. Mash the beans (I use an immersion blender) and add the reserved liquid as needed. Make them a little thinner than you like them, because they will thicken as they cool. Add the salt, and mix well (you can add more to taste if you need to). Serve warm. To freeze the beans, I ladle them into containers while they're warm and let them chill overnight in the fridge. 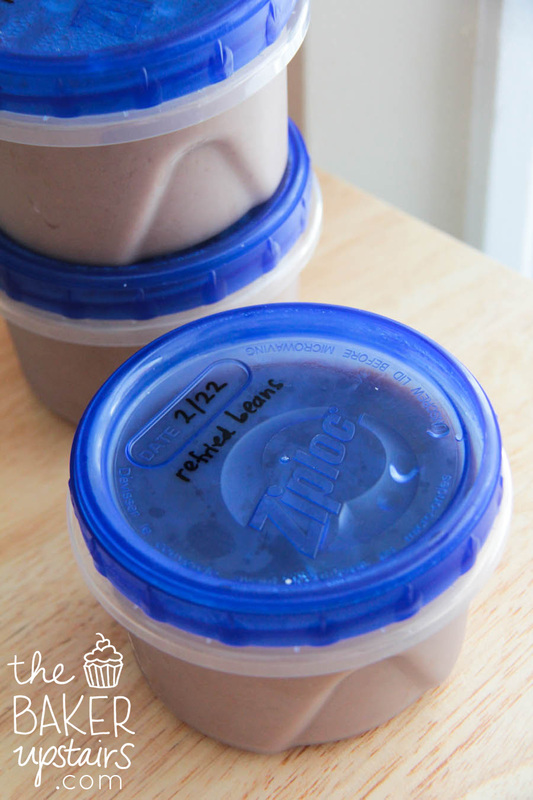 The next day, I label the containers with the date and contents, and then freeze. To thaw, I either put them in the fridge overnight, or thaw using the defrost setting on the microwave. 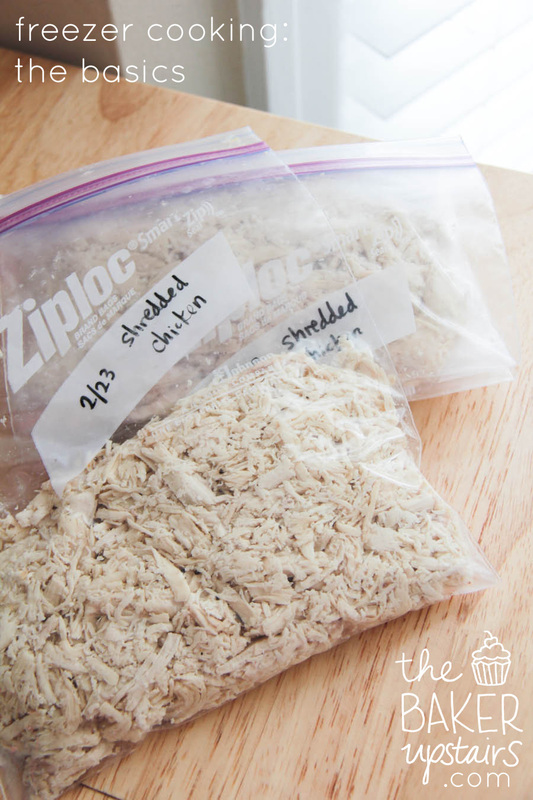 Depending on the texture, I sometimes add a little chicken broth or milk to thin them out a little after thawing. If they're too runny, I find that just slowly simmering them on the stove for a few minutes gets rid of the extra moisture. Enjoy! 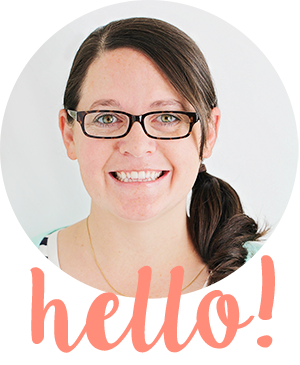 Between working part time, blogging full time, being a mom to two little girls, and trying to keep up with the endless laundry, dishes, and housework, I have so many days where I'm just too tired to cook. I actually cook and photograph most of my blog recipes for the week on Fridays and Saturdays, and the rest of the time, we eat very simply. One of the best ways that I've found to simplify our meals is to take advantage of the freezer! Whenever I'm cooking a big meal, I freeze half for another day, so we have something delicious and homemade to enjoy when I'm too tired to cook. Since soup is pretty much my favorite meal, you can usually find several quarts of soup in our freezer, just waiting for those nights when I'm exhausted. You can find my very favorite soup recipes to make and freeze here, here, and here. 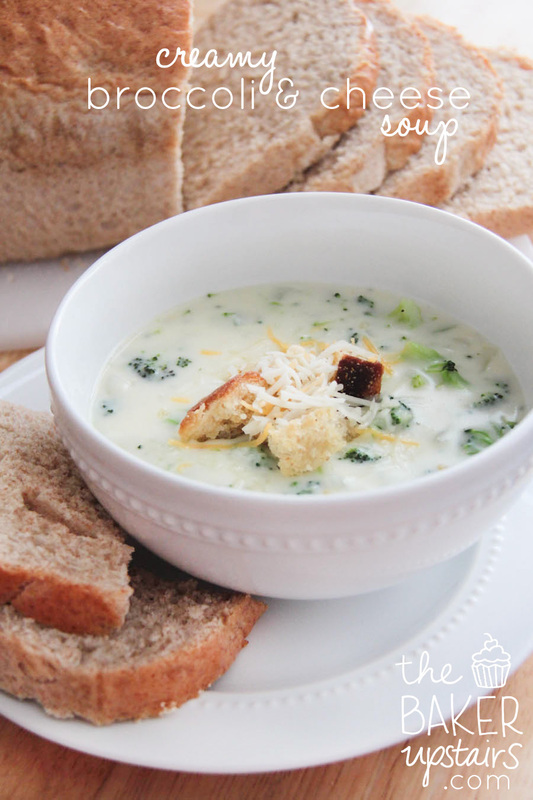 And stay tuned for a new awesome creamy broccoli & cheese soup recipe tomorrow! 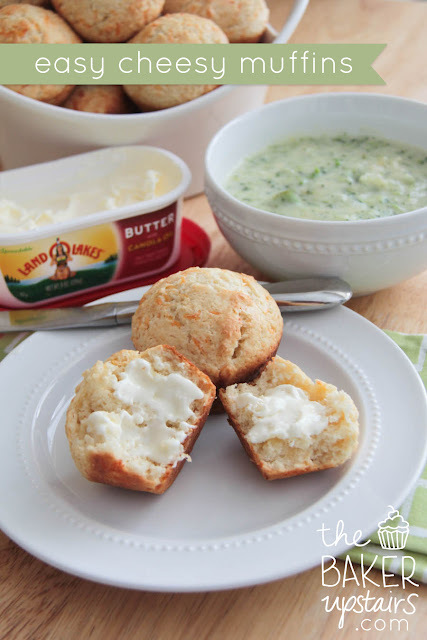 The best thing to go with soup, of course, is some fresh bread, and these easy cheesy muffins are perfect! They come together super quickly and bake up into delicious muffins that are soft on the inside and a little crunchy on the outside. Preheat oven to 400. Spray a muffin tin with cooking spray. 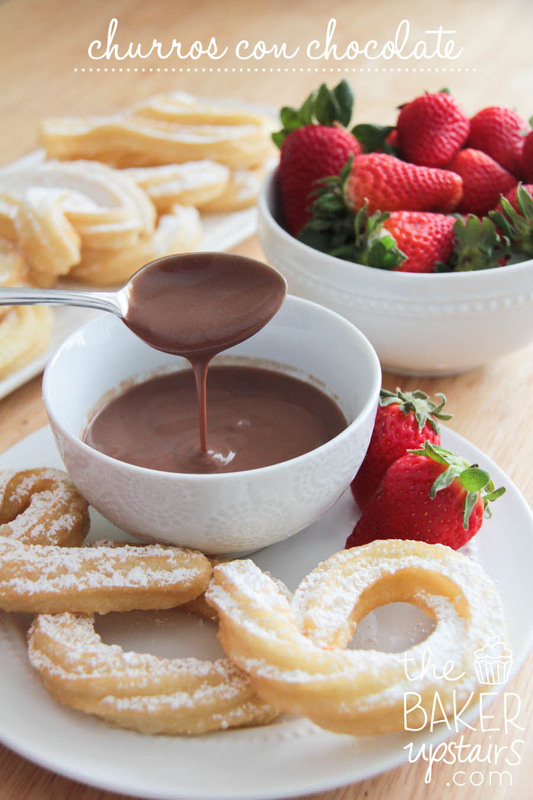 Combine flour, sugar, and baking powder in a large bowl and set aside. Whisk egg, milk, butter, and vanilla together in a small bowl (I used a liquid measuring cup). Pour the milk mixture over the dry ingredients and gently stir until just combined. Add shredded cheese and lightly stir. 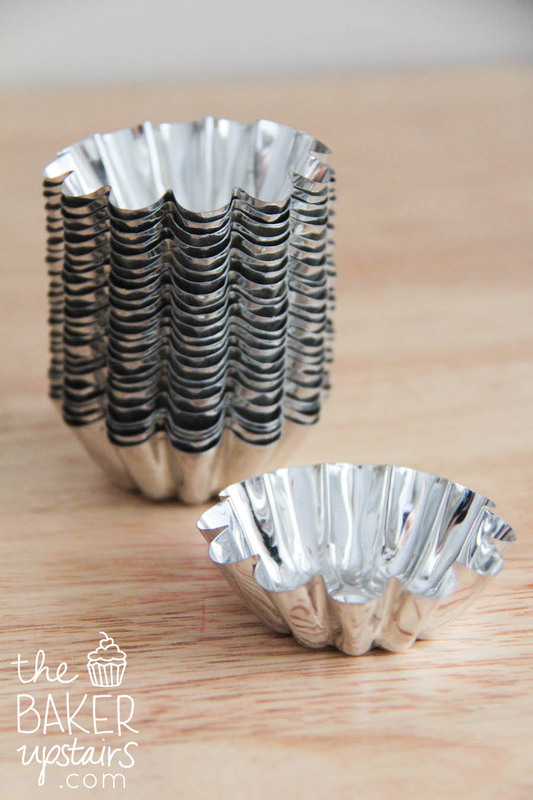 Place a scoop of batter into each well of the muffin tin. (I used an 1/4 cup ice cream scoop and it worked great.) Bake for 15 to 20 minutes, or until lightly golden brown on top. Let muffins cool for five minutes before removing from muffin tin. Makes 12 muffins. Come back all this week for more freezer cooking tips and tricks and ideas! It's freezer cooking week on The Baker Upstairs! I am by no means an expert, but I definitely have discovered some tips and tricks that make cooking (and therefore life) easier. So far, I haven't gotten into freezer cooking to the point that I'm preparing a month's worth of meals in an afternoon (someday, maybe?) but I always have a few essentials tucked away in the freezer to make dinnertime run more smoothly. First of all, shredded cooked chicken! I use this in so many recipes... tacos, enchiladas, soups, casseroles, salads, etc. It's quick and easy to thaw in the microwave or in the fridge, and it makes it super easy to add some quick protein to dinner. 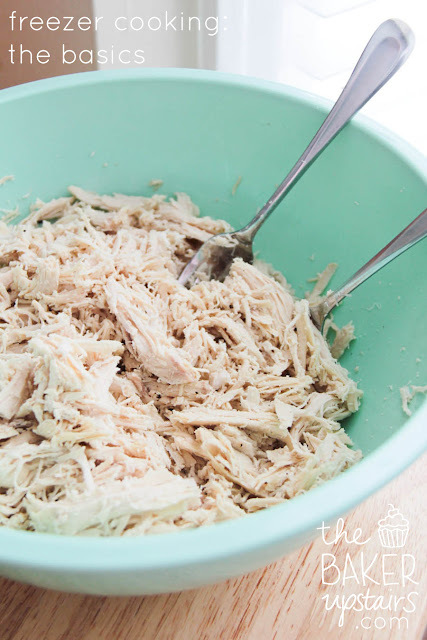 There are lots of different ways to cook chicken, obviously, but to me the easiest way is to use the slow cooker. I layer in as many chicken breasts (fresh or frozen) as I can fit (usually around 5-6), pour in 1/2 - 1 cup of chicken broth, cover, and cook on high for 3-4 hours or low for 5-6 hours. When the chicken's done, I put it in a bowl and shred it with two forks. It comes apart super easily! I usually season with a little salt and pepper, and then let it cool down just a little before putting it into freezer bags. I've had the best results with using quart sized bags and filling them up about halfway. I squeeze as much air out as I can, and then seal the bags. I label with the date and the contents, and then freeze. When it's time to thaw, I usually just use the thaw setting on the microwave, because it's quick and easy, but it would be equally easy to just throw it in the fridge the night before and let it thaw. To make tacos, I usually mix in a little salsa and taco seasoning (or just cumin and chili powder). 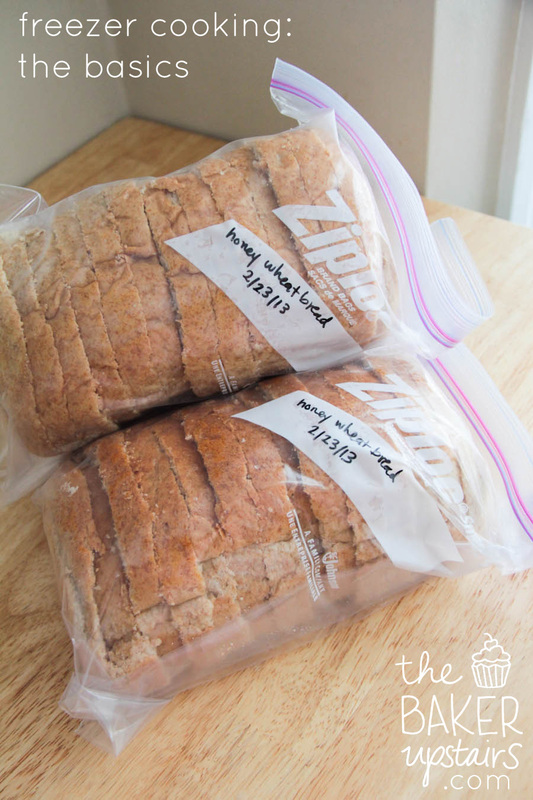 Second, I love to always have homemade bread available in the freezer. I've been surprised at how well homemade bread holds up in the freezer. Especially when I freeze it right after baking, as soon as it has cooled. You really wouldn't think it would be the case, but it tastes just as yummy and fresh when it thaws as it did before it went in the freezer. If I'm freezing loaves of bread, I like to slice them before I freeze them so it's easy to pull out a couple of slices for toast in the morning. If we want bread for sandwiches, I usually just thaw the whole loaf overnight in the fridge. I've had a lot of success with both loaves and rolls in the freezer. When freezing rolls, I like to flash freeze them first on a baking sheet, and then add them to a freezer bag after they have frozen for an hour or two. This helps them maintain their shape and not get stuck together. You can find some of my favorite breads to freeze here, here, here, and here. Stay tuned all this week for more freezer cooking ideas! There's not much that can top a warm, gooey, orange roll... not in my estimation, anyway! Last week my parents watched our kiddos so Geoff and I could go to a hockey game. I had the afternoon before the game free, and was trying to think of something I could make for the girls to eat while we were gone, that my parents would enjoy as well. 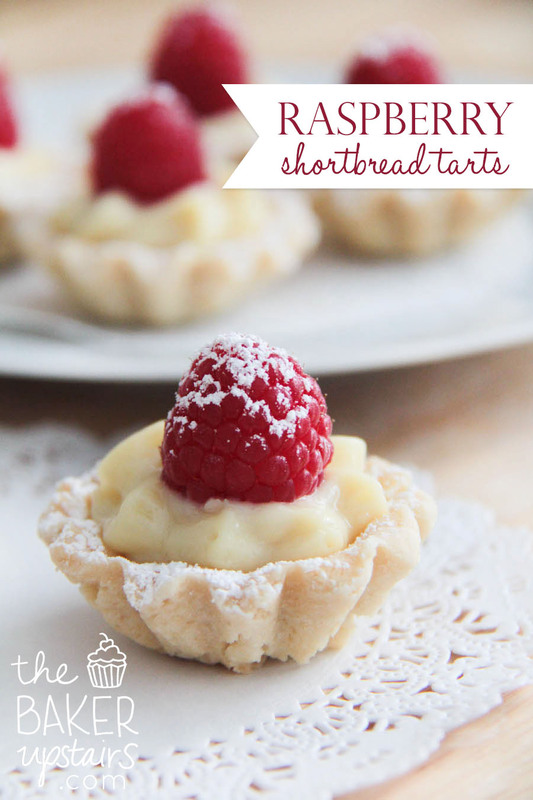 I remembered coming across these on my friend Meg's blog a few months ago, and realized that I had all the ingredients on hand. Sweet! They were super easy to mix up, and tasted amazing! When we came home from the game, my parents raved about them too. Even my little Lizzy (who eats any and all vegetables/fruits/exotic foods, but is not a big fan of bread lately) gobbled them up! 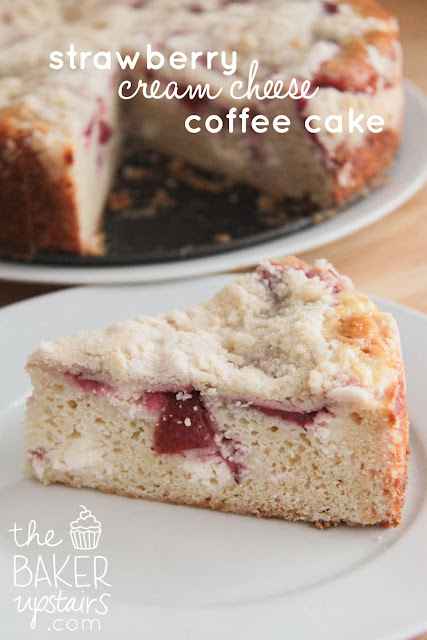 We will definitely be making these often! In the bowl of a stand mixer or a large mixing bowl, combine two cups of flour and yeast. In a large measuring cup or microwave safe bowl, combine milk, butter, sugar, and salt, and heat in the microwave for one minute, or until milk is slightly warm and butter just starts to melt. Add milk mixture to flour mixture and stir. Add eggs, orange juice, and orange peel, and stir until combined. Gradually add remaining flour, until the dough begins to pull away from the sides of the bowl, and is just slightly sticky to the touch. Let rise one hour, or until doubled in size. Separate dough into two equal-sized pieces, and let rest ten minutes. Preheat oven to 400 degrees. Spray two baking sheets with cooking spray. Roll each piece of dough into a long rectangle, about 12 x 6 inches. Cut each rectangle into twelve pieces, one inch wide and six inches long. 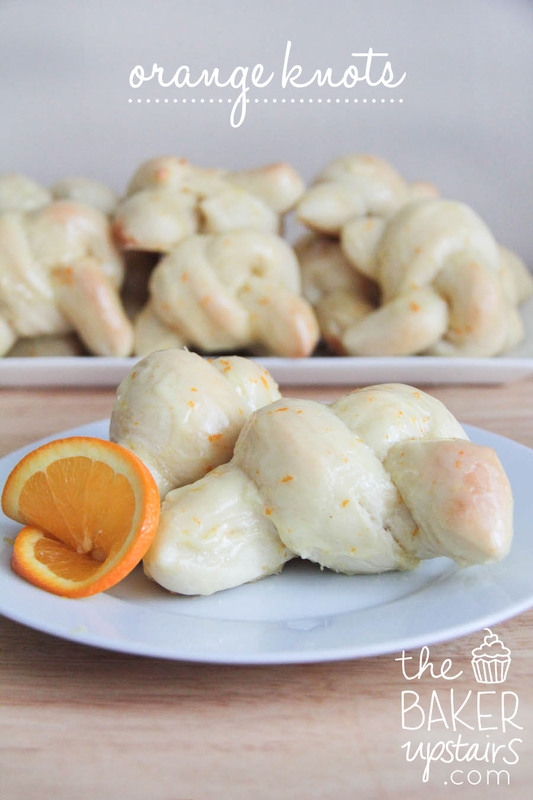 Tie each into a loose knot, and place on baking sheet. Let rise on warm oven until nearly doubled, about half an hour. Bake 10-15 minutes, or until lightly browned. While the rolls are baking, make the glaze. Whisk together powdered sugar, orange peel, and orange juice in a small bowl until well mixed. Brush over the rolls immediately after removing from the oven. A month or so ago, Geoff changed his schedule at work so that he now has an hour long lunch period. Since we live a little less than a mile from his work, this means that he gets to come home for lunch now most days. I love having a little time with him in the middle of the day, and since Lizzy is usually napping when he comes home, it almost feels like a little date! The only slight problem with Geoff coming home for lunch is that instead of eating my usual random two crackers here and a chunk of cheese there, I actually have to prepare a proper lunch. And on the days when the cupboards are bare and the fridge is full of expired food that I haven't gotten around to throwing out yet (I loathe cleaning out the fridge), pickings are pretty slim. One day last week I happened to have just the ingredients needed for this meal (and not much else) and decided to go for it. I wasn't sure how it would turn out, but it was heavenly! 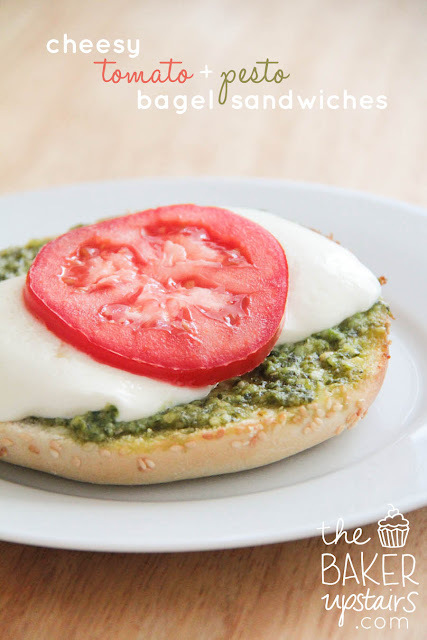 The pesto kind of sunk into the bagel and made it taste like the best basil-y garlic bread I've ever had, and the creamy mozzarella and tomato were perfect together! Even Geoff, who often raises an eyebrow at the weird hodge-podge I throw together for breakfast and lunch, said it was delicious and asked when we could have it again. Yum! Preheat oven to 375. Spread one teaspoon of pesto on each bagel half. Top each with a slice of mozzarella and a tomato, then add salt and pepper to taste. Bake 10-15 minutes, or until cheese is melted and bubbly. Enjoy! At this point, I'm tired of so many things about winter. I'm tired of shoveling the walks. I'm tired of bundling the kids up every time we need to go somewhere. I'm tired of getting stuck in the slush that collects at the bottom of my driveway thanks to the snow plow. But one winter thing I never get tired of is soup for dinner! For me, it never really stops being soup season (I make soup for dinner in July), but it is especially comforting in the winter to cozy up with a big bowl of warm soup. 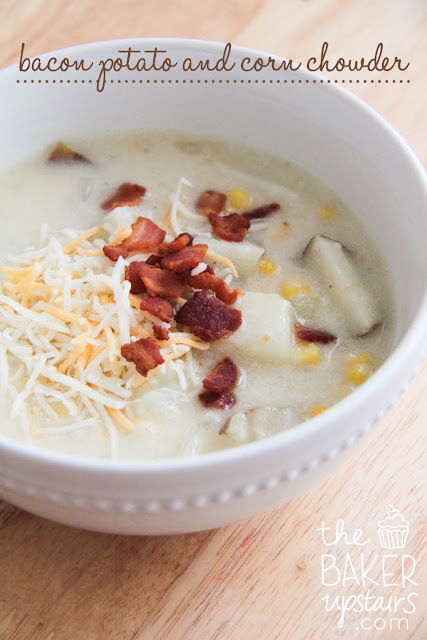 This bacon potato and corn chowder is just a nice bowl of comforting, delicious warmth! Set a large stock pot or dutch oven over medium-low heat. Add butter and melt. When butter has melted add onion and a pinch of salt. Cook for 4-5 minutes until tender and transparent. Add garlic and corn and cook for 3 more minutes. Sprinkle in flour and whisk. Slowly add chicken broth and then milk. Turn heat up to medium-high, then add potatoes. Season with salt, pepper and cayenne. Simmer for 30 minutes or until potatoes are tender. Once the potatoes are tender and the soup has thickened, turn heat off. Add in cheddar cheese and stir until incorporated. Spoon into individual bowls and top with crisp bacon pieces. Serve immediately. I always try to get excited about oatmeal for breakfast... I mean, it's super healthy, right? And filling. And a good all around breakfast. But it has always just seemed kind of... bland. (Like oatmeal.) I can tolerate it if I add roughly equal parts brown sugar and oatmeal, but that pretty much just defeats the health benefits of oatmeal. Anyway, when I came across this recipe on Pinterest, I was excited to give it a go. I love banana bread, so why not try to duplicate that flavor in my oatmeal? The result? Amazing! 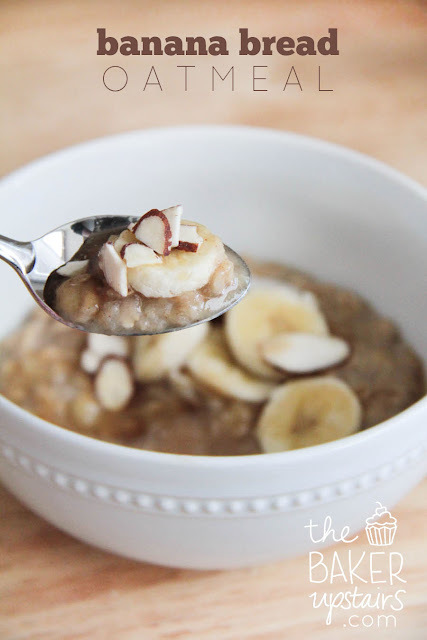 I love that the bananas give it enough sweetness that you don't have to add a ton of brown sugar, and the spices and bananas in combination with the warm oatmeal make it a bowl of comfort food. Yum! In a large saucepan, whisk together the milk, mashed bananas, and spices and bring to a boil over medium heat. When it starts to boil, add the rolled oats and cook for 5 minutes, stirring occasionally, or until the oats are soft and the liquid has been absorbed. Pour into a bowl, top each serving with a tablespoon of brown sugar, slices of banana, and nuts. So you know how I've said before that I'm not really sold on quinoa? Scratch that! One bite of this casserole, and I was head over heels in love with it. I guess my theory holds true that adding cheese to anything makes it taste delicious! What's more, I served this to my family and not a single person complained about the quinoa. (The broccoli was a different story, but I'm still counting it as a victory.) This was so amazingly yummy! 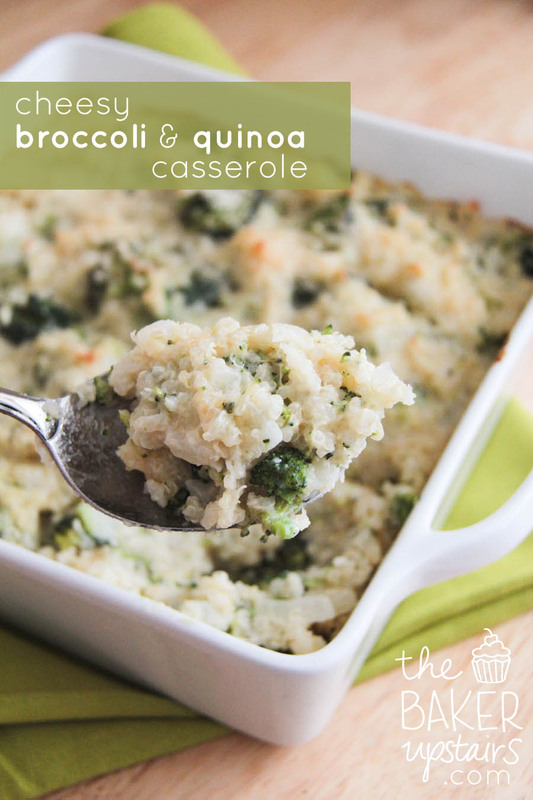 It tastes like a cheesy ricey casserole, but has all the awesome health benefits of quinoa. And it's gluten free, for those who swing that way. But really, I would make it again anyway, even if it wasn't healthy, just because it tastes so darn good. I served it with some baked salmon and fresh fruit salad, and it was a delicious healthy dinner. Preheat oven to 400°F. Grease a 9x9 baking dish and set aside. In a small saucepan, bring water to a boil. Add quinoa and salt. Reduce heat to medium-low and cover. Cook for 18-20 minutes, or until water is absorbed. Fluff with a fork and set aside. While quinoa is cooking, melt butter. Whisk in cornstarch, cook for 30 seconds. Add onion and garlic, sauté for 5 minutes - stirring as needed. Stir in mustard and cayenne pepper, and cook for 30 seconds more. Slowly whisk in milk. Simmer for 7-9 minutes, until thickened. Remove from heat and stir in cheddar cheese, stirring until completely melted. In a large bowl, toss cooked quinoa and steamed broccoli together. Carefully pour sauce over quinoa/broccoli, stirring to coat. Transfer to prepared baking dish and top with grated parmesan cheese. Bake for 20-25 minutes, or until the top is slightly browned. Serve immediately. One of the best life lessons I've learned is that you can win pretty much anyone over with freshly baked cookies. Whenever I need to make a good impression, or apologize, or cheer someone up, cookies are my first line of defense. I'm still getting to know everyone at my new job, and I figured bringing some awesome cookies to my meeting yesterday afternoon might help build some friendships. Turns out I was right! 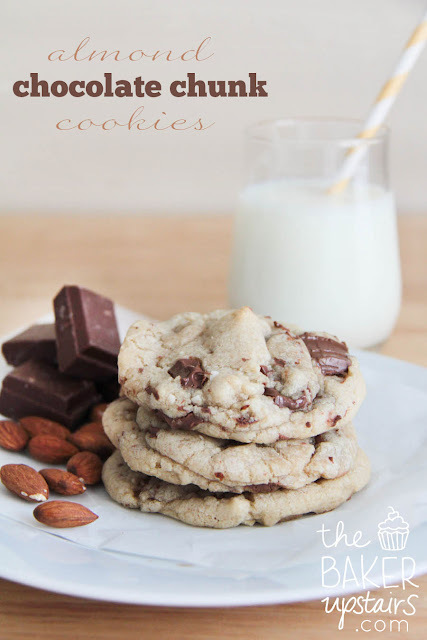 These almond chocolate chunk cookies are ah-mazing! They're huge (like, 3 inches across or so) but still soft and chewy on the inside. The chocolate chunks turn into melty pockets of heaven, and the chopped almonds add a lovely dimension to the texture. The little hint of almond flavor is a fun addition too! 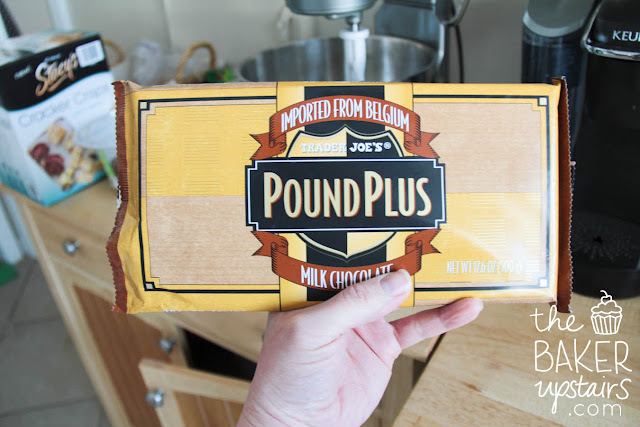 As far as the chocolate chunks, I chopped up some of this giant chocolate bar that I found at Trader Joe's (for only $4.99! Best deal ever! ), but feel free to use whatever floats your boat. Hershey's bars, chocolate chips, baking bars... it's all good! Preheat oven to 325. In a large mixing bowl or the bowl of a stand mixer, combine butter and sugars and mix until combined. Add egg and egg yolk, vanilla, and almond extract, and mix until combined. Add flour, baking soda, and salt, and mix until just combined (be careful not to over mix). By hand, mix in chocolate chunks and chopped almonds. Divide dough into eighteen large balls. Pull each ball into two pieces using your hands. Place one half, rough side down, on a lightly greased baking sheet, then place the other half, rough side up, on top of the first half. Bake 12-15 minutes, or until very lightly browned around the edges. The middles of the cookies should still be soft. Let cool on baking sheet for 5-10 minutes, then remove to cooling rack. Enjoy! 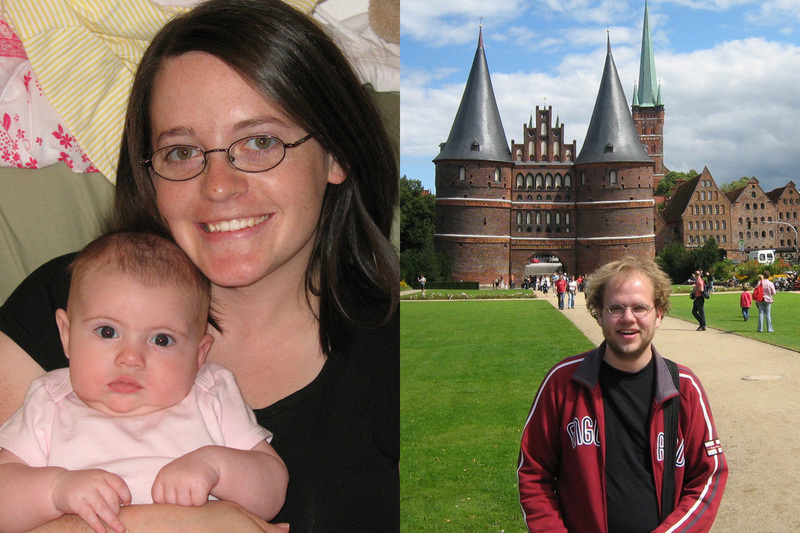 When my daughter Abby was about two months old, Geoff flew to Germany to teach classes there for about six weeks. I was a first time mom, with an unusually fussy baby (she had GERD, and we didn't know about it), and it was terrifying to me to think of being on my own for so long. I remember dropping him off at the airport, and crying so much on the way home that I had to pull over. I know, sad, right? All I could think about was that Geoff was going to go around, exploring castles and viking settlements, and I would be stuck at home with a screaming baby and no help. Amazingly, though, within just a few days, Abby and I had a comfortable routine going. She started sleeping through the night, and I found that I enjoyed the freedom that came with not having another adult's needs to consider. We developed a really great routine of walking for about an hour every night with a friend from the neighborhood, and I spent the days playing with Abby, and cleaning or doing crafts while she was napping. The thought of cooking dinner for just myself was a little overwhelming, so I subsisted mostly on Lean Cuisine and Lean Pockets, and loved it! By the time Geoff came home, I was much more confident and sure of myself as a mom. What had started as a nightmare ended up being one of the best experiences of my life, because it taught me to trust myself. 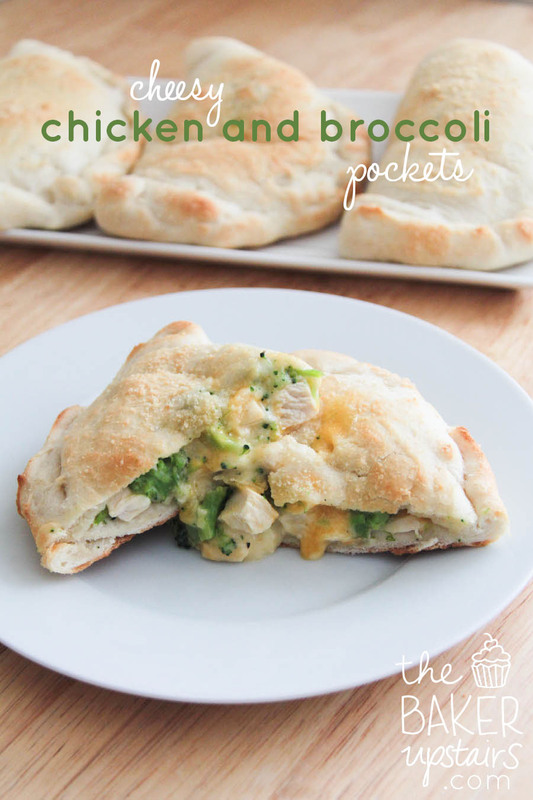 So how does this all relate to the above chicken and broccoli pockets? Well, one of my favorite meals from that period was the chicken and broccoli flavor of Lean Pockets. I probably went through at least one package of them per week while Geoff was gone. Now that I'm much more confident in my cooking skills, and also more interested in eating whole foods and making things myself, I decided it was high time to recreate that flavor combo at home. And, like most things that are homemade, these completely blew the original out of the water! I am completely in love with these pockets, and could eat one for lunch every day. (And last week, I did...) Seriously, make them! Preheat oven to 450 degrees. Combine yeast and sugar with warm water and allow to sit for 5-10 minutes until bubbly. Add flour, salt, and oil to yeast mixture. Combine wet ingredients in dry ingredients into mixer and knead for 5 minutes until dough is smooth and just slightly sticky. Allow to rise for at least one hour. While the dough is rising, make the filling. In a medium saucepan, melt butter. Add flour, and whisk until combined. Let cook for a few minutes, until very lightly browned. Add milk and chicken base, and quickly whisk until the flour mixture is mixed in completely. Cook for a few minutes, until thickened. Remove from heat, and whisk in shredded cheese. Set aside for a moment to cool.In a medium bowl, combine broccoli, chicken, and chunks of cheese. Pour cheese sauce over the top, and mix to combine. Divide dough into 6 pieces. Roll each piece of dough into circle. Scoop 1/6 of the filling onto one side of each piece of dough. Be careful to keep the cheese sauce at least an inch away from the edges, or they will be difficult to seal. Pull the other half of the dough over the top of filling and seal the edges closed. Using a fork, pierce the top of the pockets once or twice to allow steam to escape. Brush the tops of the pockets with a little olive oil, and sprinkle with parmesan cheese. Bake at 450 until golden brown - about 12-15 minutes.